What happens when a dozen international ceramics artists meet to eat, work and play with more than a half ton of clay for four weeks? Inspiration, permutation, exhilaration and a celebration known as East-West Ceramics Collaboration V—an exhibition of contemporary new works in clay ranging from graceful porcelain and traditional vessels to bold abstract sculptural forms and humorous flights of fancy. The exhibition opens with a program October 23 in the Art Auditorium on the University of Hawaiʻi at Mānoa campus and continues through December 9. As much a process as a show, East-West Ceramics Collaboration V presents works created by Pacific Rim artists who shared studio space in the UH Mānoa Art Building during summer 2011. The artists shared cultures, ideas and views about art as they worked side by side. “The workshop was truly exciting. 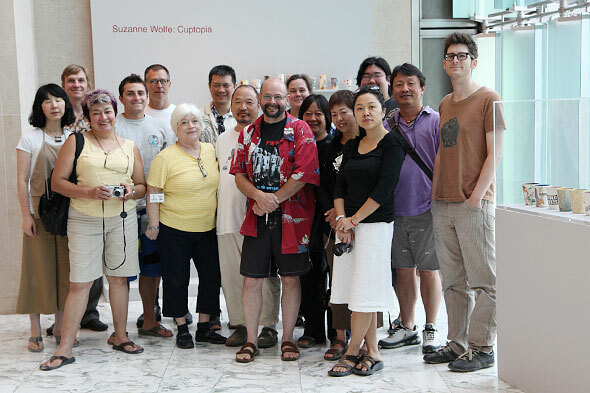 There was a lot of exchange and collaboration, hard work, long hours, camaraderie and fun,” says Mānoa Professor of Art Suzanne Wolfe, who organized the workshop and curated the exhibition with Assistant Professor of Art Brad Evan Taylor. An internationally exhibited artist known for her mold-making and image transfer, Wolfe has taught ceramics and art history at UH for more than 40 years and organized seven ceramics workshops since 1995. She will reflect on her experiences with the ceramics collaborations in a talk at 2 p.m. Sunday, October 23, followed by the opening reception beginning at 3 p.m.
As the exhibition continues, gallery tours will be offered by Taylor or Wolfe at 2 p.m. on Nov. 6, 13 and 20 and Dec. 4, 2011. Many of the works will be available for purchase. “The exhibition presents an excellent opportunity for everyone to see the tremendous potential and variety that clay offers as a medium,” says Taylor, who previously taught in Korea and thinks about geology, landscape and the environment while creating large-scale works that test the limits of clay. “We hope that the visiting artists return home and develop similar workshops to continue this kind of exchange,” says Wolfe. “The collaboration was a great experience for the art students who assisted with the workshop and worked with the professionals,” she adds. A related exhibition features new work by those students at the art department’s Commons Gallery, October 23–28.